Most good walks involve a little bit of fear. A steep rock climb or a narrow cliff path always spices up a walk. But when that fear is a constant terror for 3 solid hours it gets a bit much. I started my night walk at Bossington near Minehead and headed up Selworthy Hill just as it was getting dark. Within minutes I had bats whizzing past my head at lightning speed. I held up my map and hunched my shoulders. Then the path became very narrow as it followed the edge of the cliff. And then it became very steep. Battling the impulse to turn around and run back to my car screaming, I carried on, shining my torch to be able to see the barely recognisable path. It was hard walking but I didn’t stop to rest, I was too scared. By now a steady terror had set in. 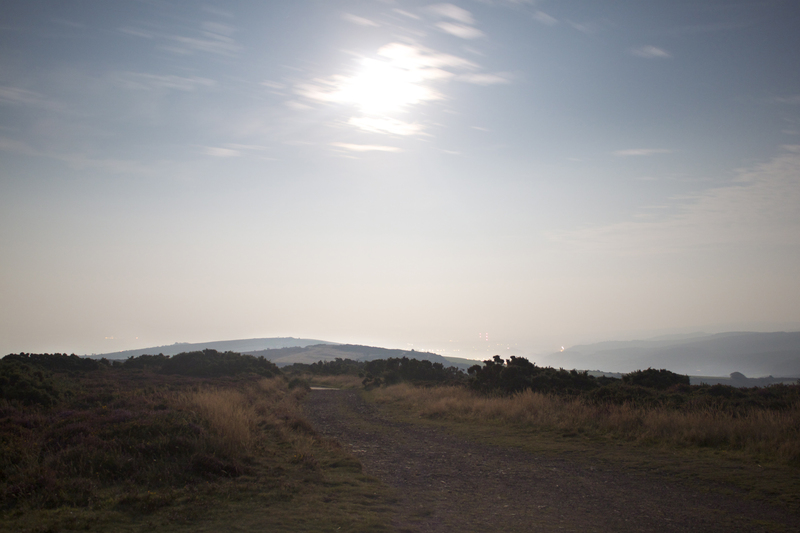 After an hour or so I reached Selworthy Beacon where I calmed myself down enough to get my camera out and take some photos. I was quite proud of myself for conquering my fears of the dark. I set off and ate a chocolate biscuit to reward myself. Just then a small shape emerged from the bushes and ran straight at me. I couldn’t get my torch on it fast enough to see what it was. It lurched away from me and ran round in circles, dust flying up from the ground as it skittered around. I panicked and shouted but, because my face was filled with chocolate biscuit, all that came out (apart from crumbs) was a “Mmmmnnngggg! Mmmmnnnnn!” as I stamped my foot on the floor to scare the creature away. It was like being stuck in a nightmare where you’re scaring away a demon but someone’s covering your mouth! It was a rabbit. Or a hare. It ran away and I fell into fits of relieved nervous laughter. The rest of the walk was filled with a similar terror, mainly from my own imaginings. I whistled to calm myself down but just imagined someone else whistling the same tune from the darkness. I was glad to get back to the car but it was hard to shake off the fear as I checked the back seat of my car to make sure no one else had got in. It wasn’t until I was back in bed that I felt safe again. It felt like a proper adventure and I think I really earned this tick on my list.